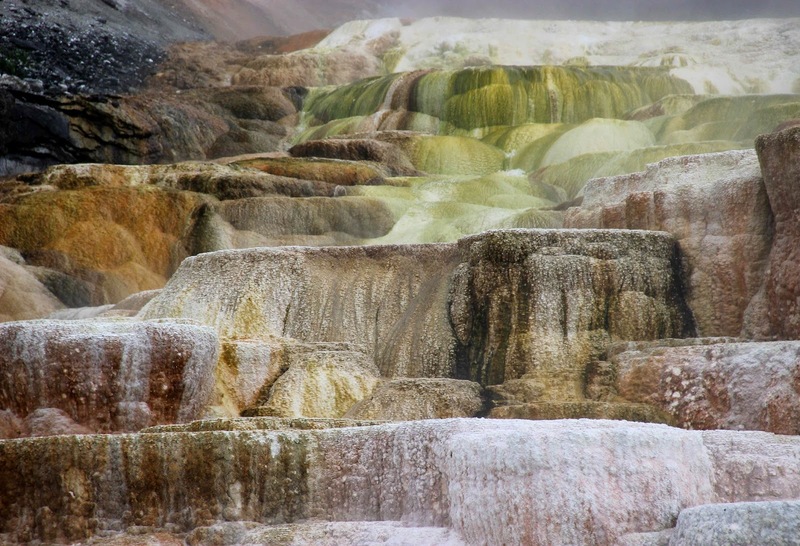 Yellowstone National Park -- land of wonders both natural and unnatural. No matter how carefully one plans a vacation, sometimes things just don’t work out. Most years, late August is a wonderful time to be in the high country. Bugs are few. Crowds, so to speak, are dwindling. And the weather’s good ... most years. But this year it wasn’t. There was rain and then more rain and finally snow. 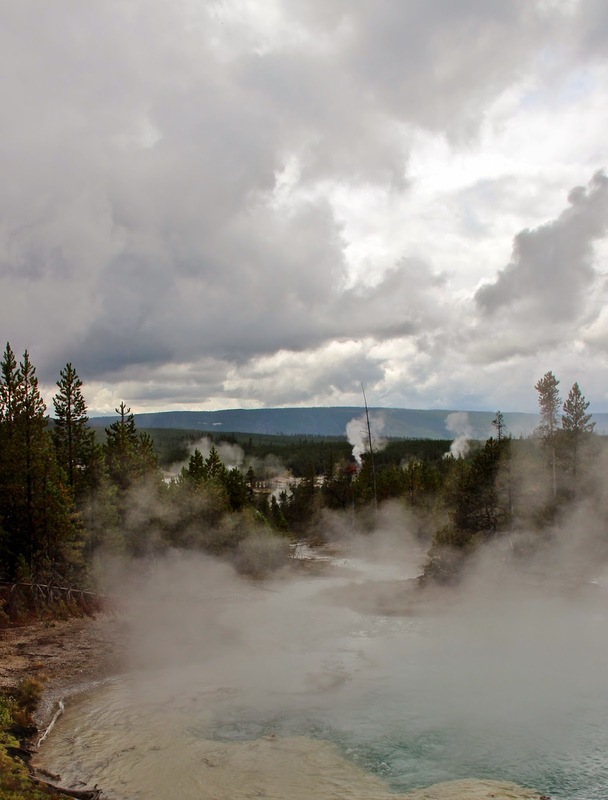 One day we headed to nearby Yellowstone National Park, with the hope that bad weather would ameliorate summer hassles. No such luck. There were the usual crowds, stressed-out visitors, and traffic jams for charismatic mega-fauna. I tried hard not to let these annoyances obscure the natural wonders, and I mostly succeeded. Remains of a shallow sea that used to cover western Wyoming. The first stop was not far from the Northeast Entrance, where Madison limestone is exposed in a road cut. Fossils are common enough to qualify it as “fossil hash”. This was a shallow sea 350 million years ago and apparently teeming with life -- brachiopods, crinoids and other critters. Their remains were preserved in limy mud that became the Madison. 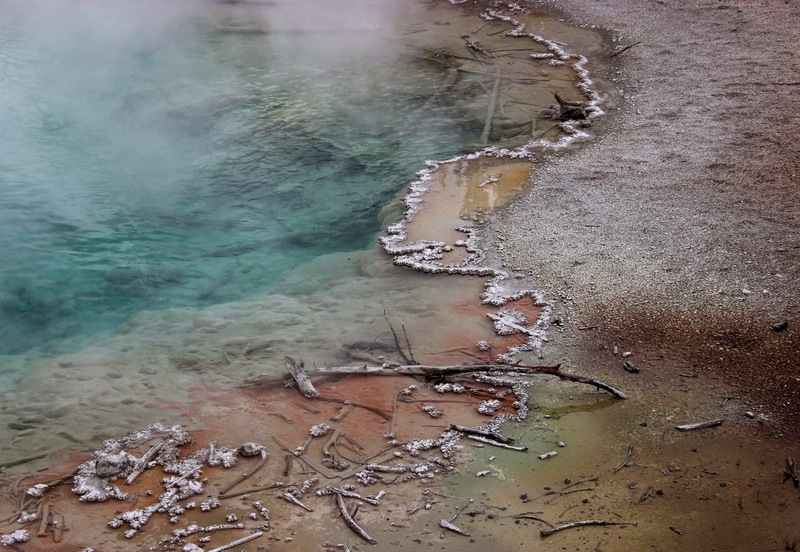 It’s widespread in Yellowstone, but is largely covered by thousands of feet of volcanic rock from Absaroka volcanos 50 million years ago, as well as the more famous catastrophic eruptions just 600,000 years ago. 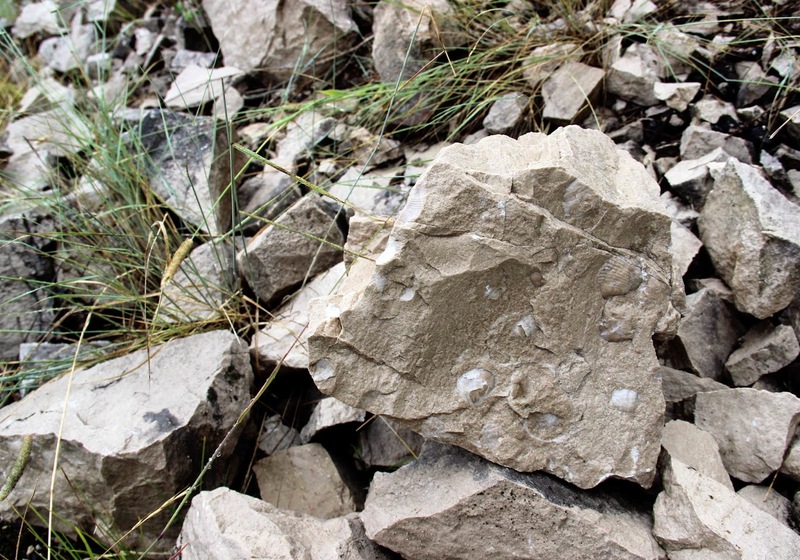 The Madison limestone probably is the main source of material for travertine in the Park, for example at Mammoth (see end of post). The road cut is part of Vignette # 3 in Marc Hendrix’s Geology Underfoot in Yellowstone Country (highly-recommended). It was easy to get to, and the hunt was fun. Fossils were abundant as promised, but I took only photos. Collecting is prohibited in National Parks. 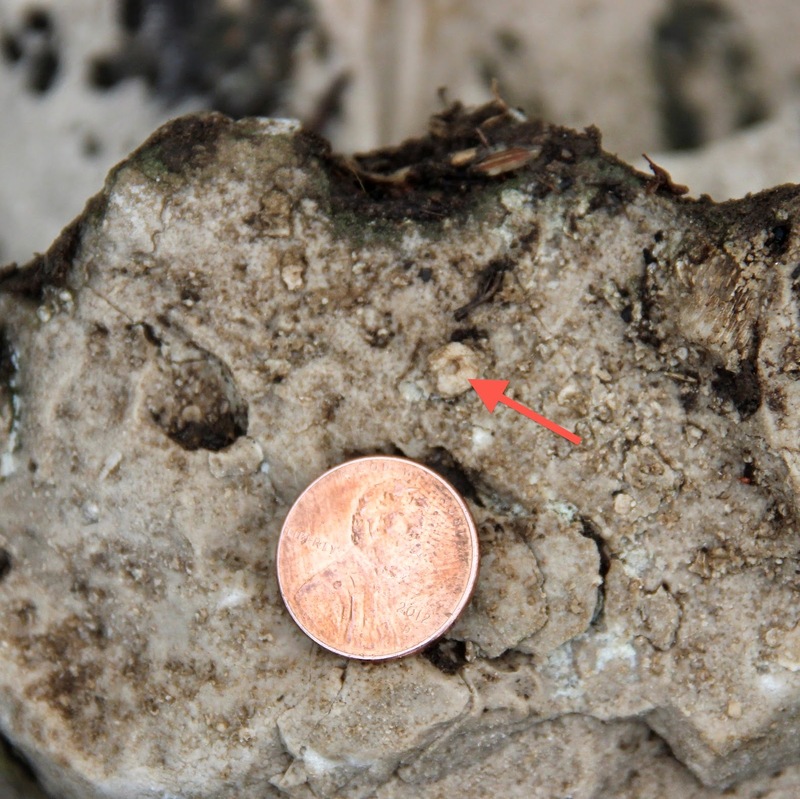 The red arrow above points to a segment of a crinoid stem or columnal. 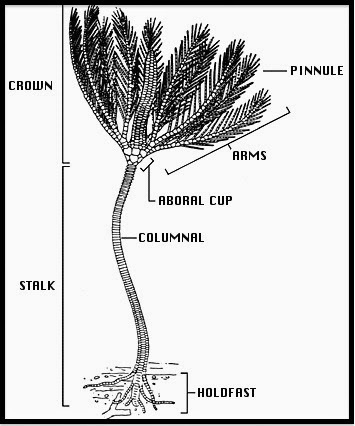 Crinoids were abundant in these shallow seas, and columnal remnants are said to be the most common fossils in the hash. Reconstructed crinoid, from The Tree of Life. 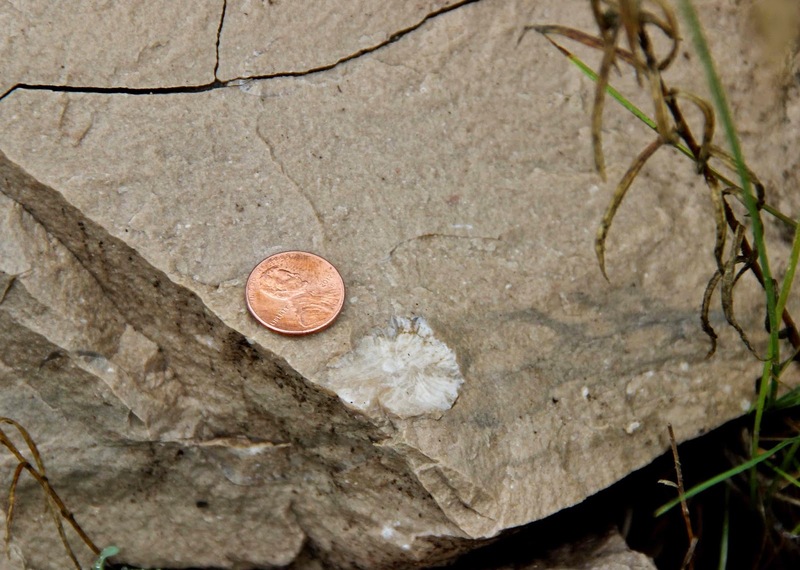 Here’s a mystery fossil -- could it be a crinoid calyx or crown? This is just a guess so if you find this photo in an online search, don’t use it! We continued down Soda Creek to the Lamar Valley. Its beauty was sublime -- the river meandered through broad grasslands with dark conifer forests and volcanic rocks on the slopes above. It went on for miles. Rain and mist added to the beauty, but kept me from taking photos. 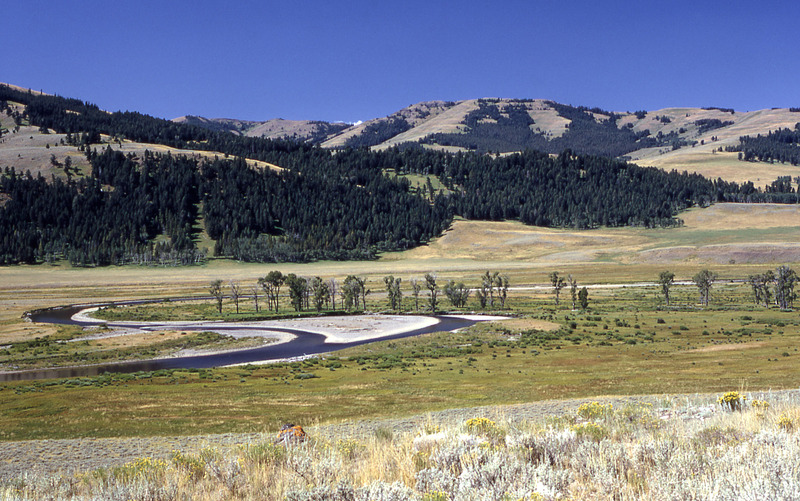 The Lamar River Valley on a clear day, from Yellowstone’s Photo Collection (NPS). The rain let up a bit as we approached Tower Junction. We stopped just past a bison jam to check out glacial kettles in a hummocky ground moraine. 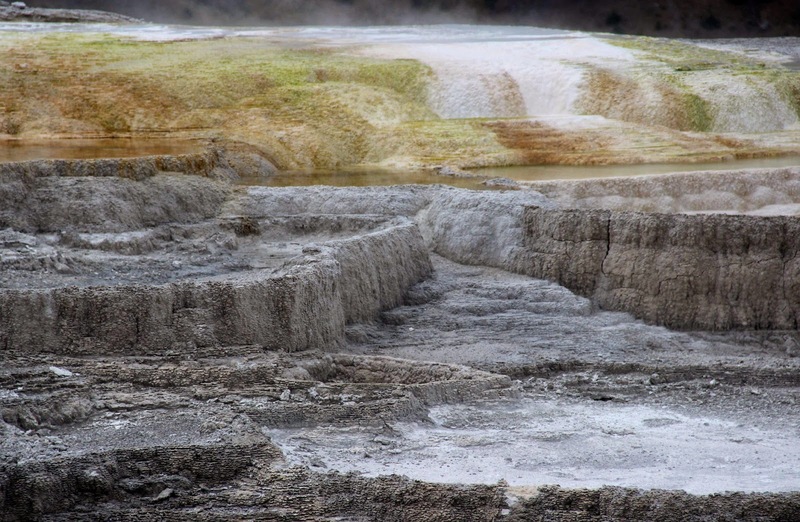 Yellowstone was very much glaciated during the Pleistocene, under hundreds of feet of ice. 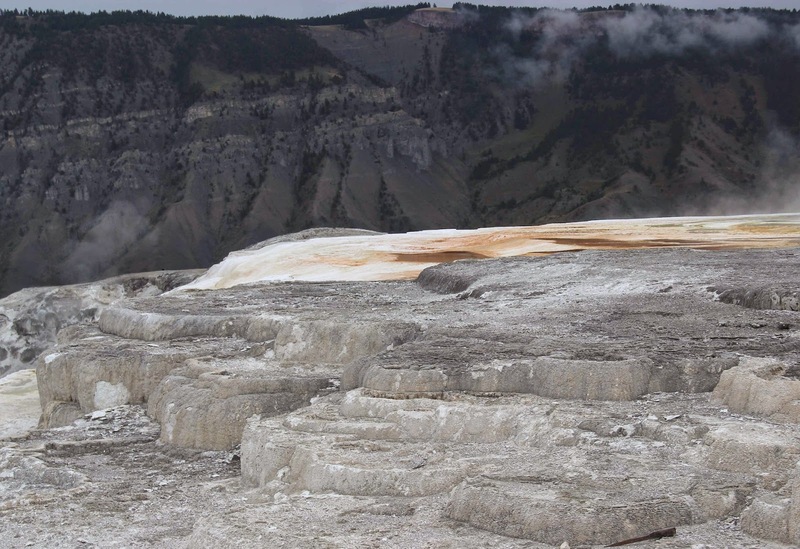 This was the Yellowstone Mountain Ice Sheet, the largest ice mass south of the continental ice sheet (Carson 2010). 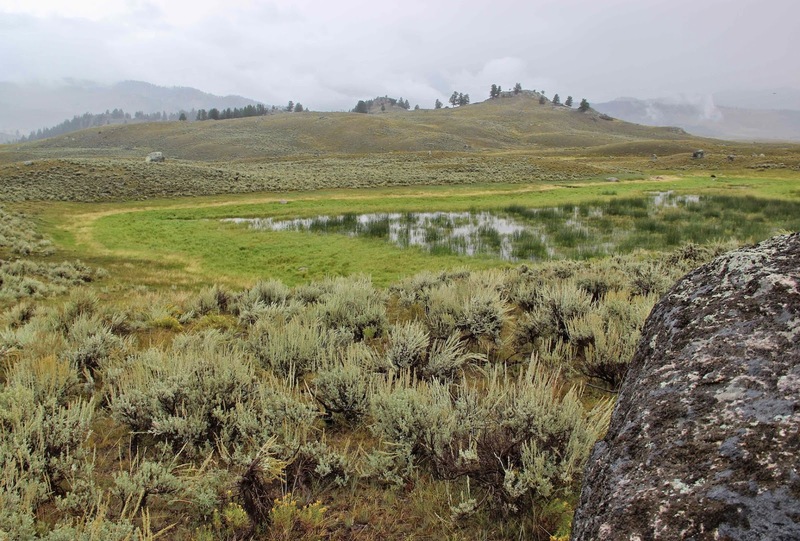 Glacial features abound in parts of the Lamar Valley -- kettles, moraines and erratics galore. 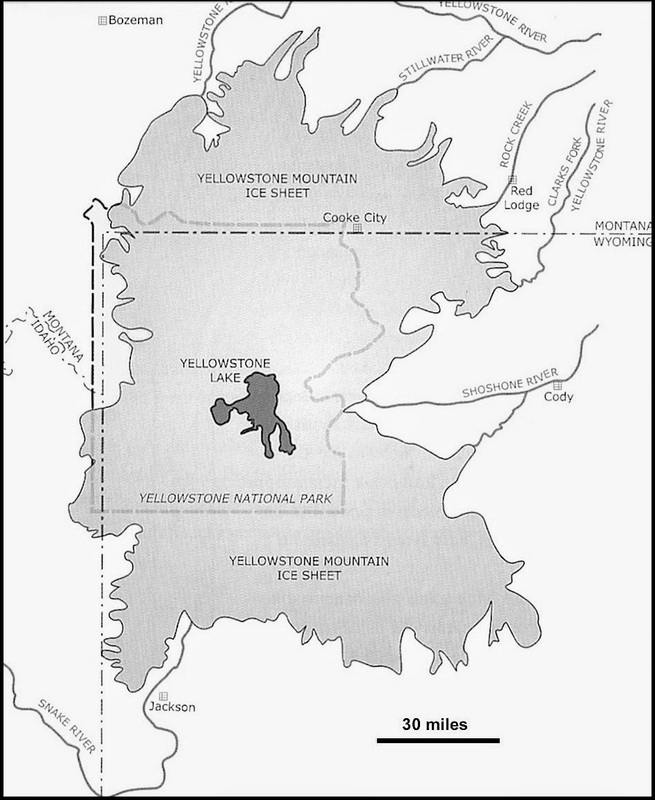 Extent of the Yellowstone Ice Sheet, based on Carson 2010. Click on image to view. Kettles form when blocks of ice break off the front of a retreating glacier and then melt in place. Now 12,000 years later, the kettle below supports healthy wetland vegetation, a pond and a pair of ducks. Ground moraines are made of rocks, dirt and other unsorted sediment (till) deposited under a glacier, either because it was scraped off or because the glacier was retreating, i.e. melting back (glaciers don’t actually move when they “retreat”). This particular ground moraine is well-preserved because it was deposited when the last of the Pleistocene glaciers melted (Pinedale glaciation); there was no more advancing ice to disturb it. The many erratics are made of Precambrian granite and metamorphic rocks. They were transported south by ice moving down from the Beartooth Plateau. Erratics on hummocky terrain. This ground moraine is part of Geology Underfoot Vignette #15. 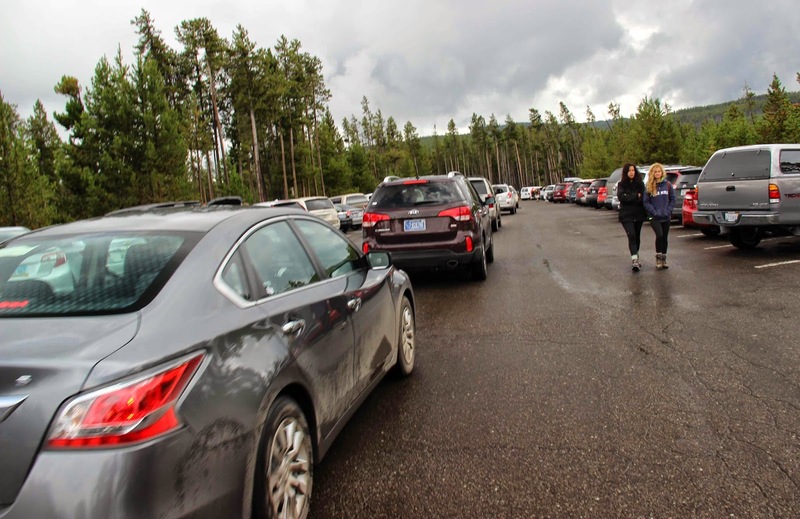 At Tower Junction, we turned onto the “Grand Loop” and joined the frenzy that is Yellowstone in summer ... even on rainy days. Fortunately geology, ecology and photography kept me from going insane. I scanned road cuts as we passed through the “core of an ancient volcano” -- Mount Washburn is one of the Absaroka volcanos of 50 million years ago. We stopped near Dunraven Pass, where the effects of the great Yellowstone fires of 1988 were obvious and striking. Many dead trees were still standing, even after 26 years. And young lodgepole pines were growing thick like weeds. 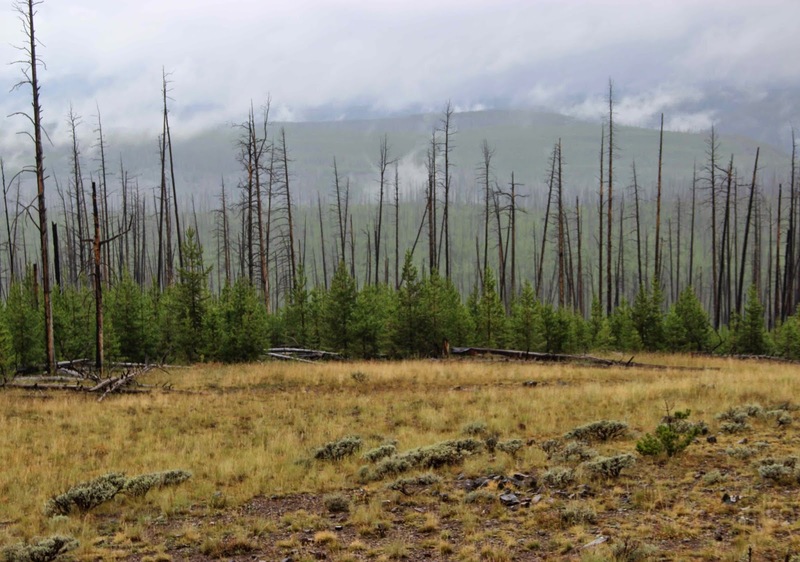 Lodgepole pine saplings thrive amid the standing dead. 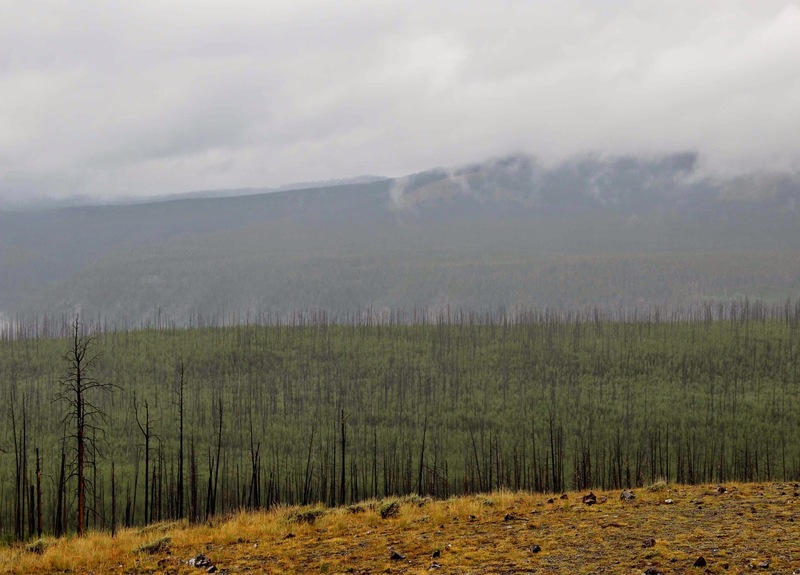 There were many many many acres of dense young lodgepoles (Pinus contorta). At Norris Geyser Basin I took a short hike to investigate some of the hydrothermal features for which Yellowstone is famous, and for which the Park was created (1872). The scenery was wonderfully bizarre, and the colors were great, even under gray skies. Trails were in use but not crowded. People strolled, chatted, speculated, laughed and took photos free of care. There must have been many wet iPhones and iPads that day! "Could we cook our fish in it?" 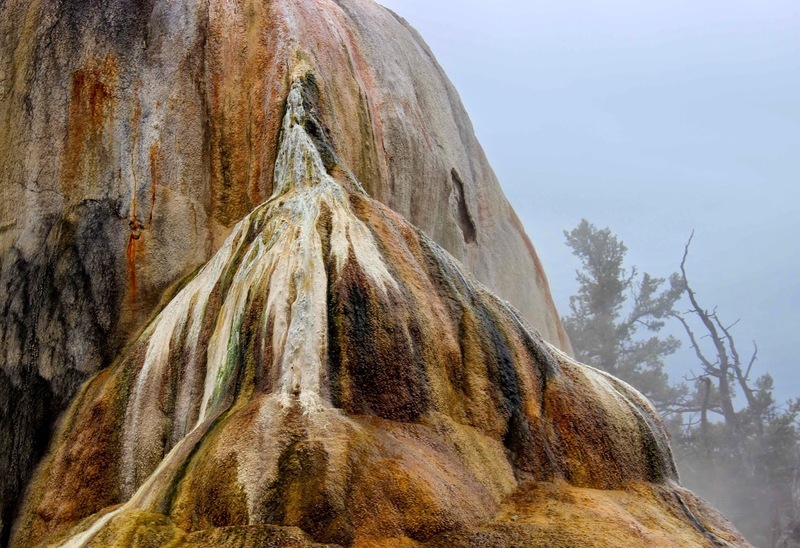 -- Veteran Geyser. "It smells like a stink bomb!" 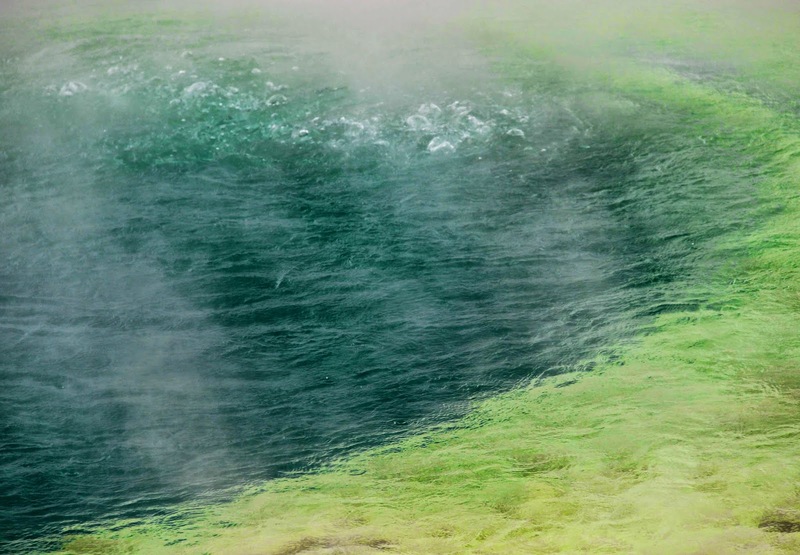 The kid was right -- lovely Emerald Spring reeks of sulfur! 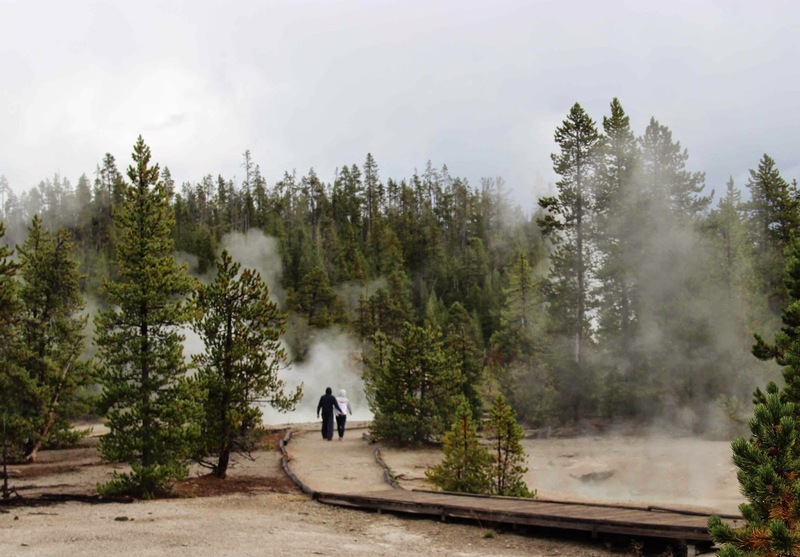 Sweethearts stroll through the geyser basin. All trails are on boardwalks. 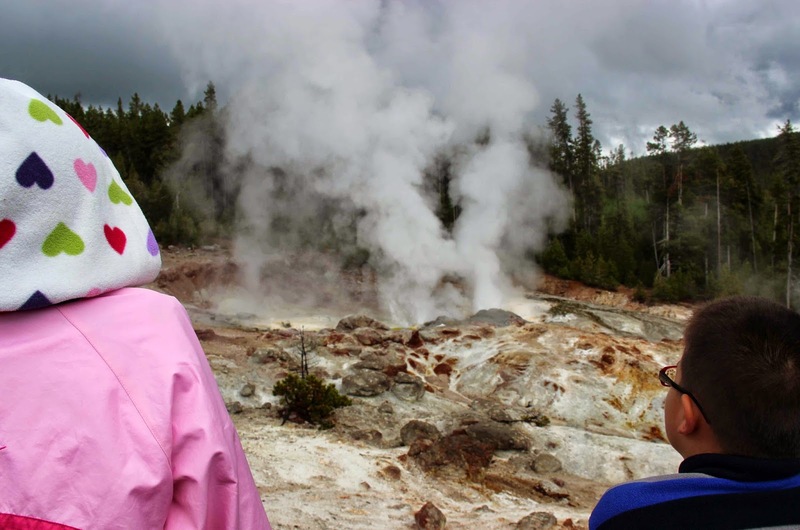 Hoping for a really big spurt from Steamboat Geyser. It's the tallest in the world ... when it's active. I tried to imagine what it would have been like to be an explorer walking through thick pine forests, to see “smoke” rising ahead, and then to come upon these unexpected landscapes. 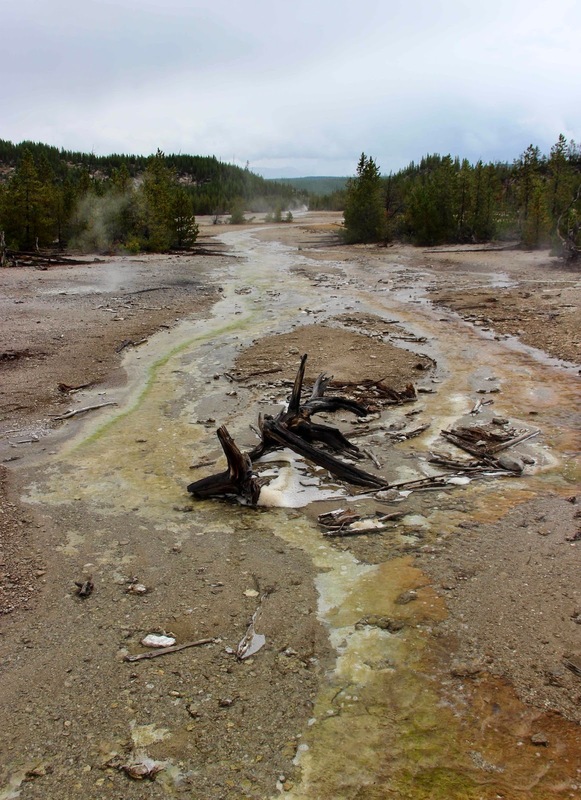 The ones in Norris Geyser Basin are especially weird, often devoid of vegetation or with scattered remains of the dead. And what did folks think when they suddenly found mesmerizing brilliantly-colored streams and pools of bubbling stinky water?! Thin sheet of flowing water. 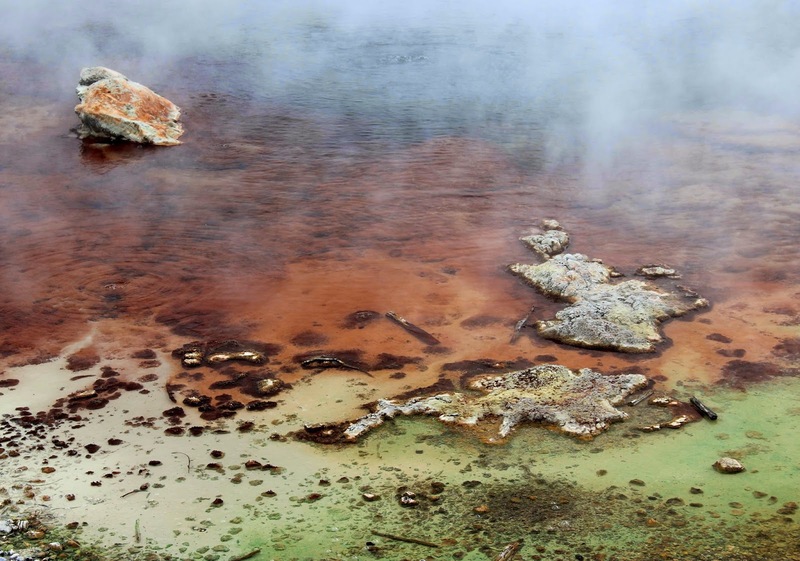 Bacteria, algae and non-biological precipitates color the geyser basin. The sounds were really eerie. Sometimes there was no obvious source, just a low rumbling underground. It was easy to believe I was walking on the roof of Hades. I tried to capture sounds with movies, but they weren’t nearly as impressive as the real thing. Here are two of the louder features I came across. 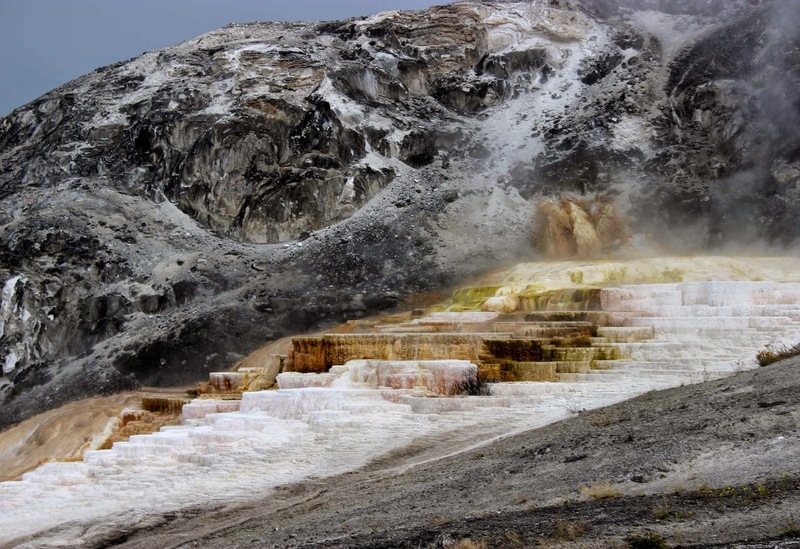 We finished at Mammoth, famous for hot springs and spectacular terraces. I thought back to the first stop of the day at the outcrop of Madison limestone -- probable source of carbon dioxide and calcium carbonate from which these travertine features are built. Looking down on Mammoth from travertine terraces off the Upper Terrace Loop. By the time we reached the trailhead it was getting late. The sun, which hadn’t done much all day, was now threatening to set. I hurried along the boardwalk to a spot with active terrace growth (flowing hot chemical-laden water), and thus great colors. 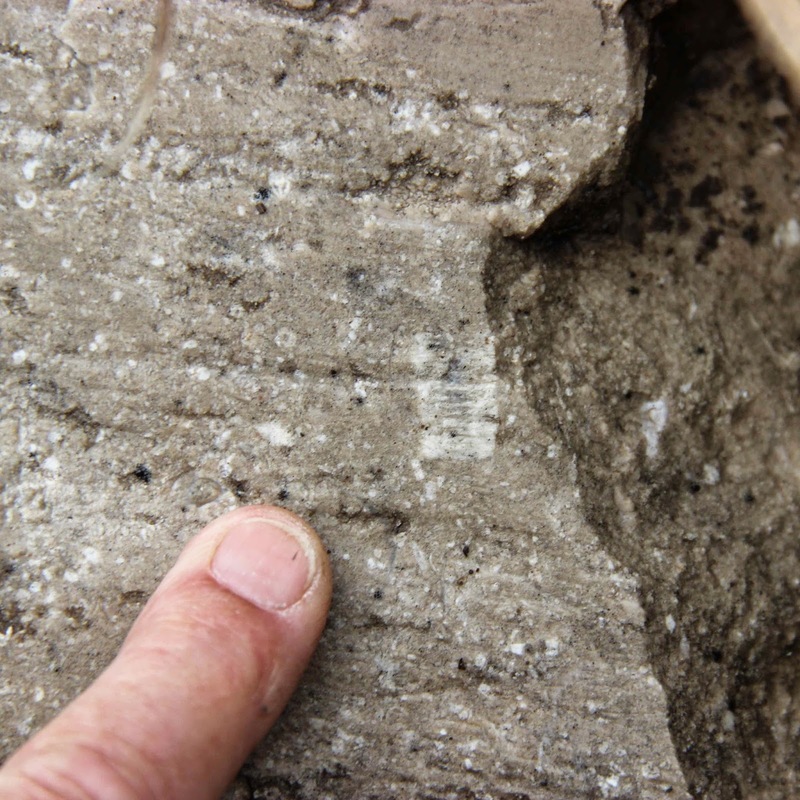 Old travertine is shades of gray and tan. Active areas seem so colorful in comparison. ... and so it went until it was time to leave. This cascade of pools and small terraces was enchanting. The textures were as wonderful as the colors. Mammoth is Vignette #17 in Geology Underfoot in Yellowstone Country. 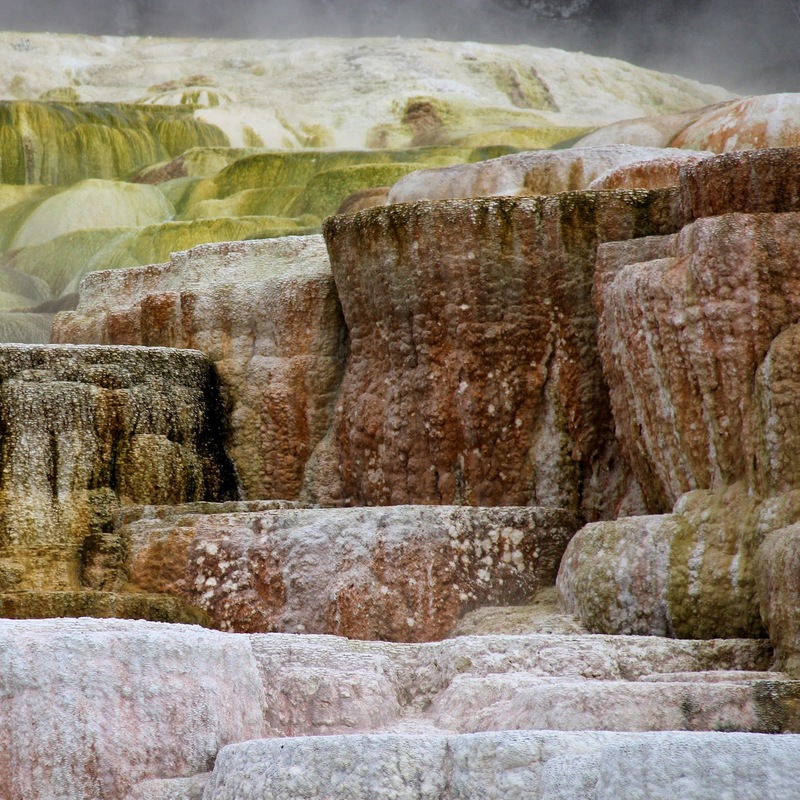 Hendrix includes lots of interesting information about travertine development at Mammoth, and its varied forms. Sadly there wasn’t time to do more than a small fraction of the Mammoth tour before we had to drive home to our wet campsite. Bryan, TS. 2008. 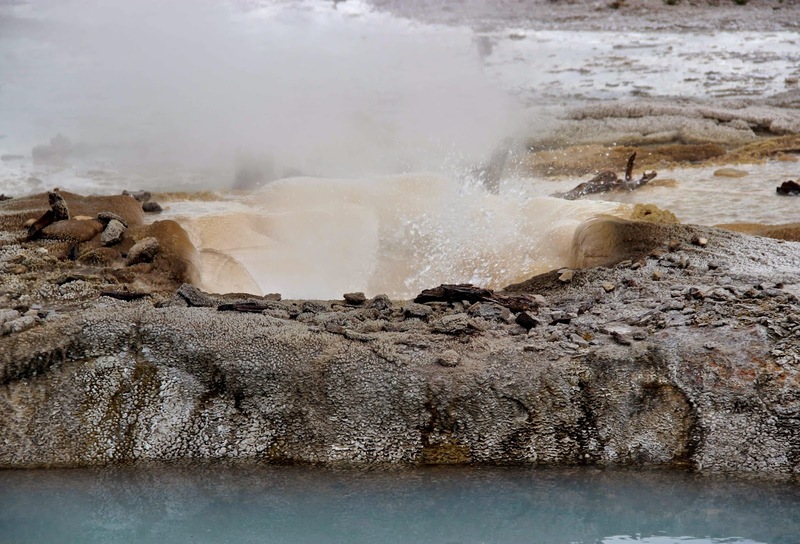 The geysers of Yellowstone, 4th ed. Boulder, CO: University Press of Colorado. Hendrix, MS. 2011. Geology underfoot in Yellowstone country. Missoula, MT: Mountain Press Publishing Co.
Lageson, DR and Spearing, DR. 1988. Roadside geology of Wyoming. Missoula, MT: Mountain Press Publishing Co. In the mid-1800s, hundreds of thousands of gold-seekers, pioneers, pilgrims and other dreamers took the Oregon Trail west. 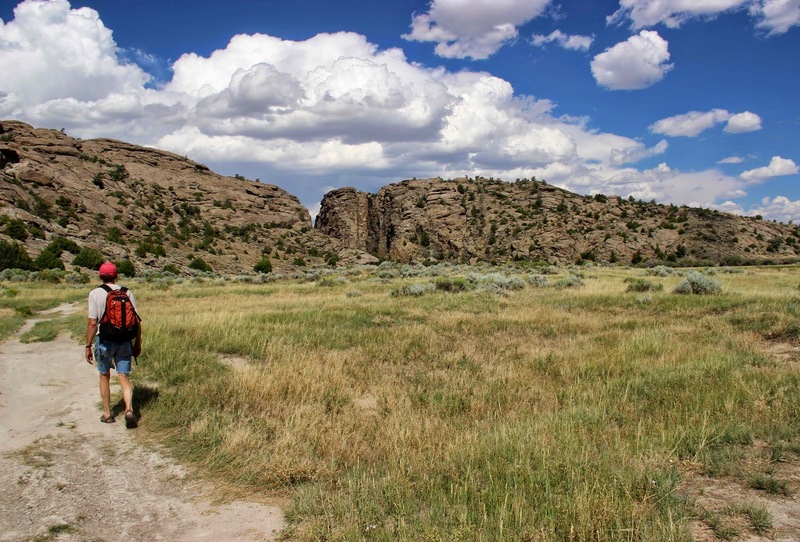 They followed the valley of the blessed Sweetwater River across what is now central Wyoming, finding grass and drinkable water in an arid land of alkaline streams. 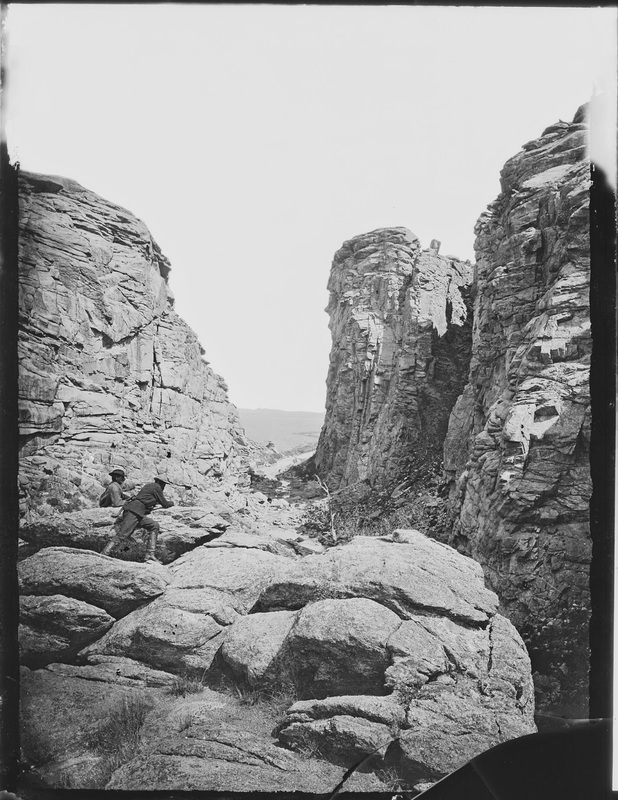 Several miles upstream from its confluence with the North Platte, the Sweetwater cut through a granite ridge via a gap impassable to wagons, hand carts and other vehicles of the day. Travelers christened it “Devil’s Gate” and made a short detour to the south. Why didn’t the river go that way? It would have been so much easier! Western part of original Oregon Trail; red arrow points to Devil’s Gate. Map by Ezra Meeker. Devil's Gate in 1870, William Henry Jackson; Public Domain. Devil’s Gate isn't as odd as it might seem. 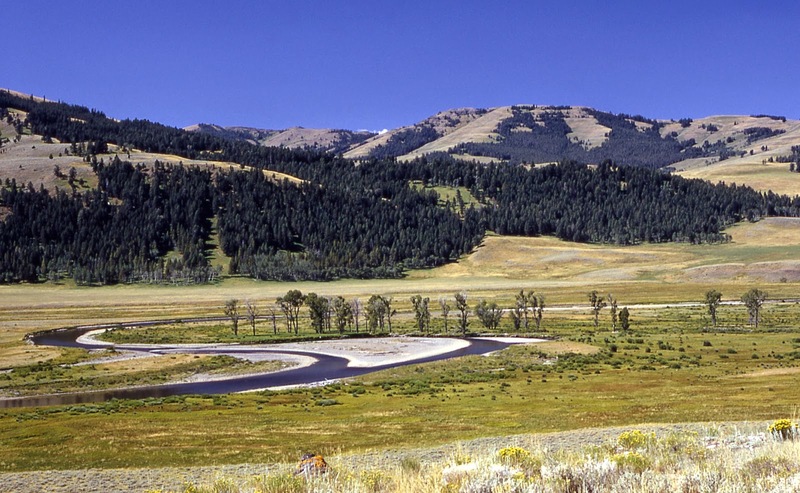 In Wyoming, it’s not unusual for rivers to cross ridges and even entire mountain ranges. We have lots of superimposed drainages. Devil's Gate is where the superimposed Sweetwater River crosses a granite ridge at the east end of the Sweetwater Rocks. 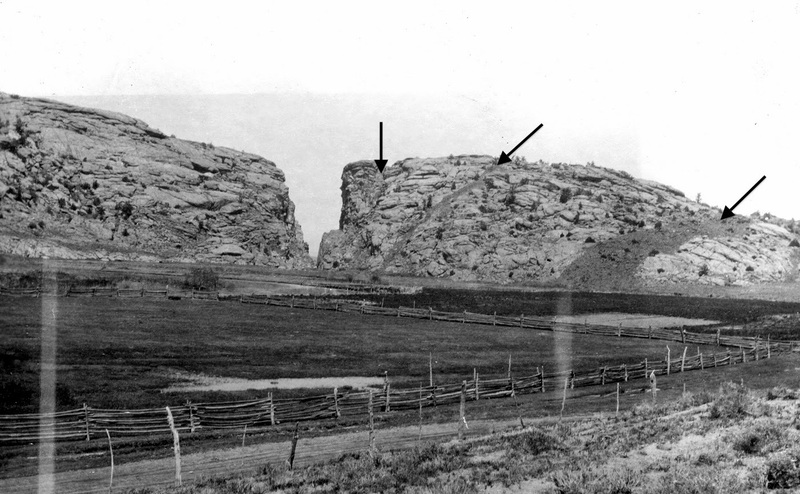 These were the high peaks of the Granite Mountains before the range collapsed (see this post). From Google Earth; labels added. Click on image for a better view. 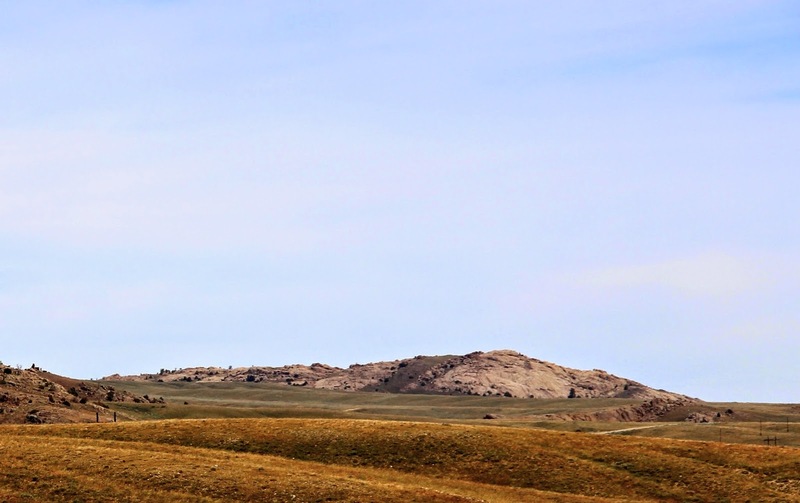 Roughly five million years ago, Wyoming mountain ranges were largely buried. Streams flowed on the surface above, oblivious to underlying topography. Then widespread erosion set in and streams were lowered down onto whatever was below -- in some cases rock ridges or mountain ranges. They had no “choice” but to cut through. For more about cycles of regional burial and exhumation, see this recent post. Block diagrams by Brainerd Mears, Jr., after originals by Samuel H. Knight (Regional Geomorphology class, University of Wyoming, 1984). The ridge crossed by the Sweetwater River is mainly Precambrian granite, estimated to be 1.8 billion years old (Lageson and Spearing 1988). There also are occasional dikes of darker rock, for example in the area of Devil’s Gate. 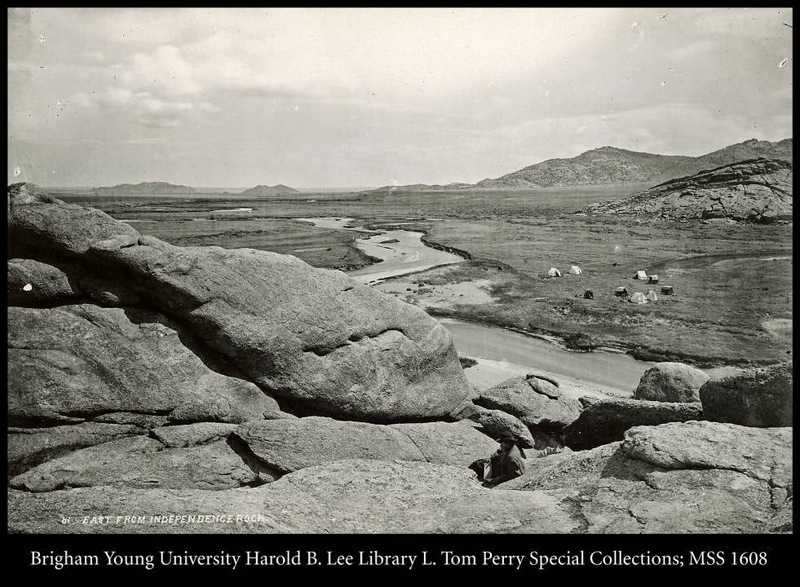 "Granite with dikes of dark intrusive rock (Devil’s Gate) ... June 1922." 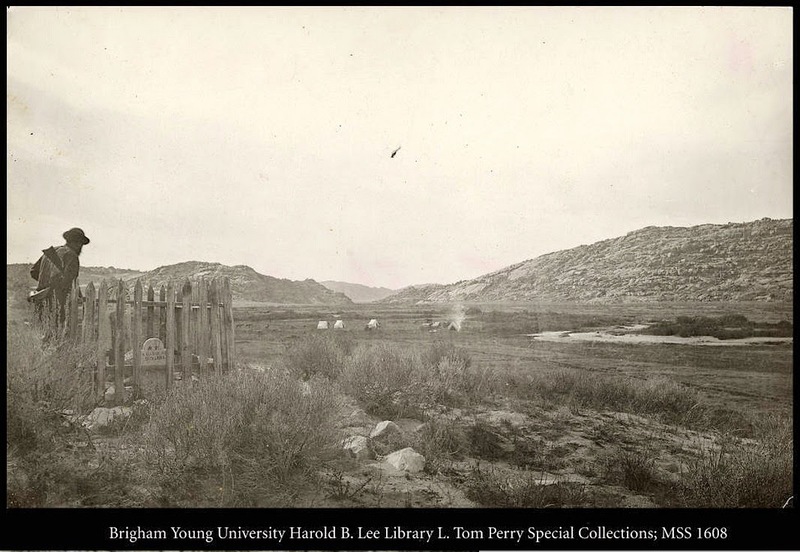 WT Lee, USGS Photographic Library [arrows added]. 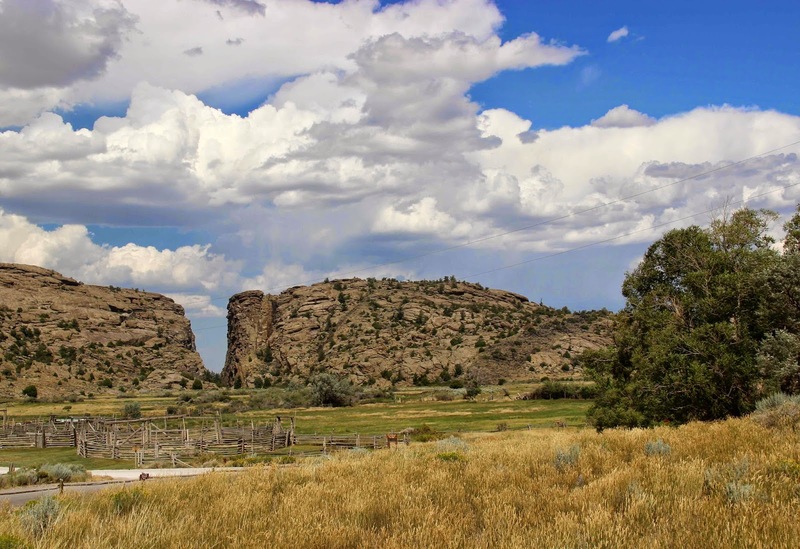 Devil’s Gate and dikes, August 2014; click on image to view. The interpretive sign at the end of the trail explains that “volcanic activity split the granite ... and forced molten basalt into the fissure”. 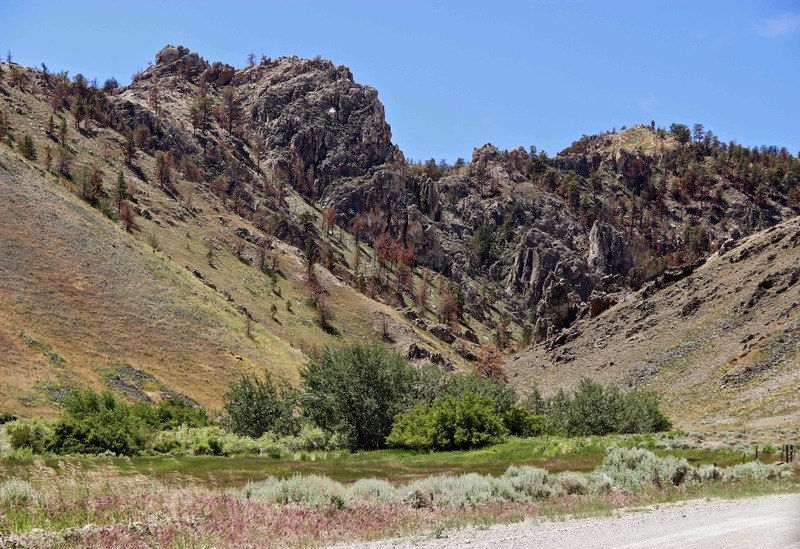 But the dikes more likely are diabase, the shallow intrusive equivalent of basalt (see Granite Mountains by the Wyoming Geological Survey). They're Precambrian in age, truncated before deposition of Cambrian sandstones (Love 1970). The diabase is softer than the surrounding granite, so the Sweetwater River was able to cut through the ridge via a conveniently-located dike. Start of trail to Devil's Gate; Split Rock in distance. Devil’s Gate is a National Historical Site, part of the California National Historical Trail. 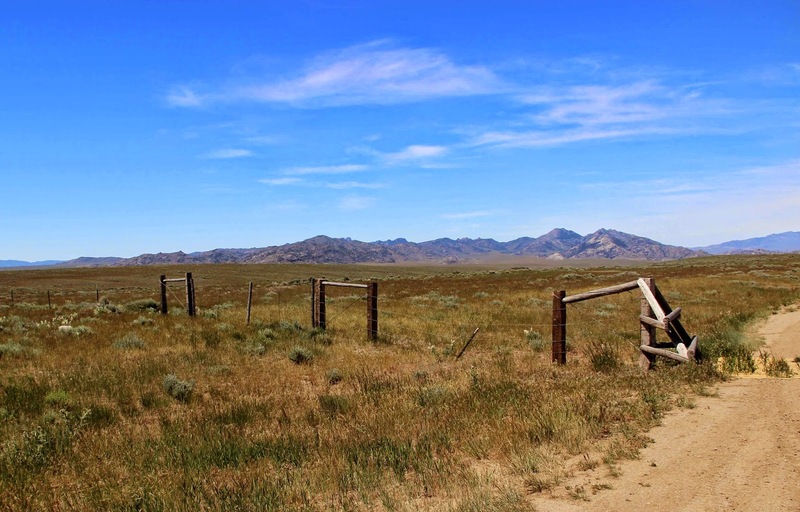 The gap is on public land (Bureau of Land Management) and can be reached by a short trail that crosses the Sun Ranch, now owned by the LDS Church. 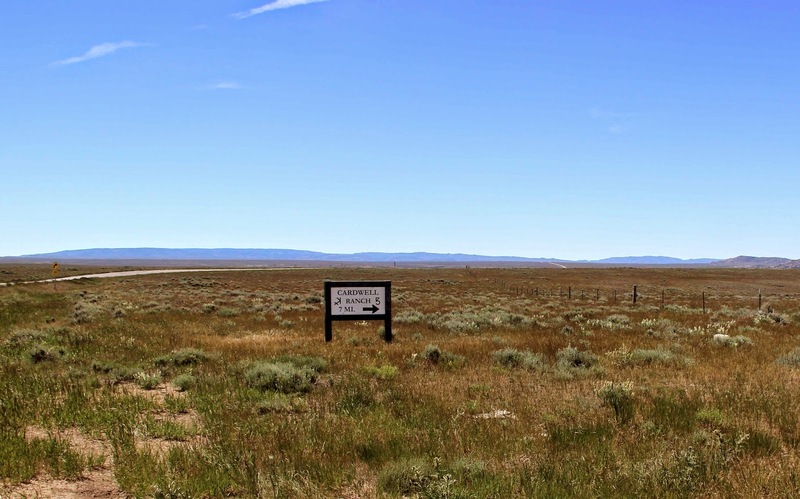 The Church bought the ranch to develop a site memorializing an ill-fated Mormon party that may have sought refuge nearby. It also tried to buy adjacent public land through Federal legislation (public land normally isn't for sale). This stirred up quite a bit of concern and protest among Wyoming citizens. The effort failed for good when several Indian groups also expressed interest in purchasing sacred sites. 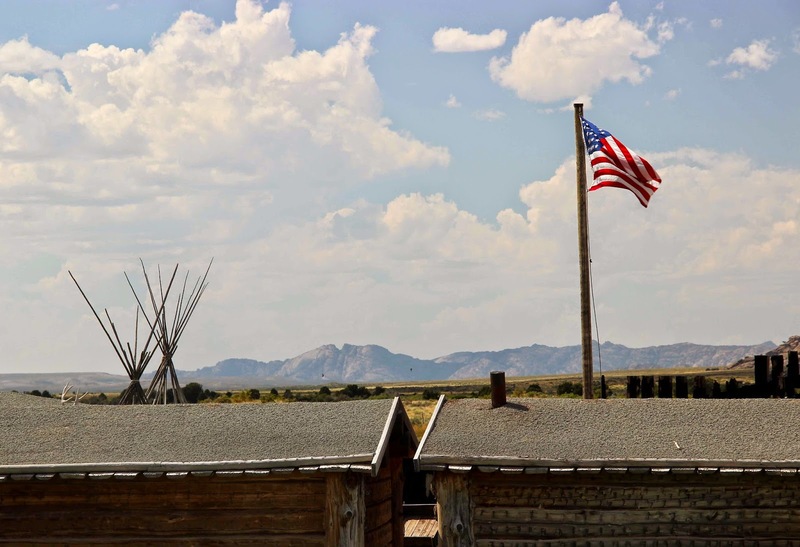 Instead, an agreement was reached which includes access across the ranch. See this site for more information. The hike to Devil's Gate. Love, JD. 1970. Cenozoic geology of the Granite Mountains area, central Wyoming. USGS Professional Paper 495-C. 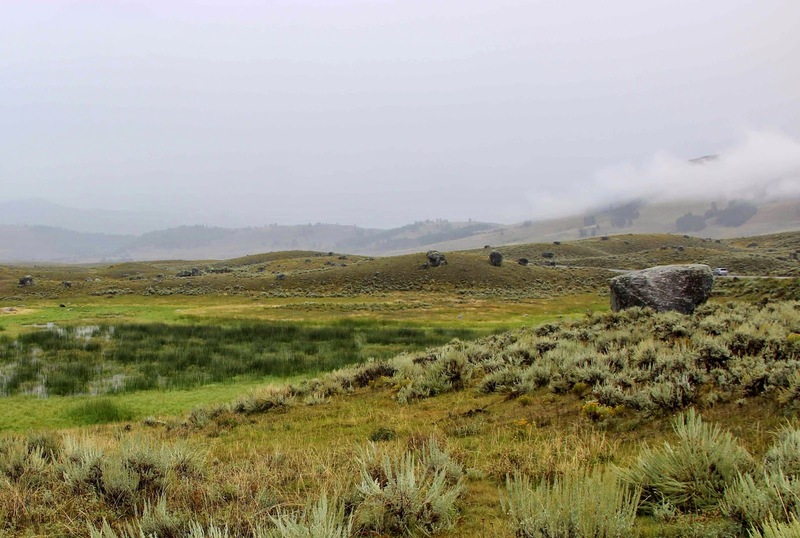 This is the final post in a series about a recent trip through the “Heartland of Laramide Tectonics” in south central Wyoming. By definition, this a folded land. It was deformed during the Laramide Orogeny, the period of mountain-building that created the Rocky Mountains. But when I left Alcova Reservoir and drove south, the landscape quickly changed from folded to flat. 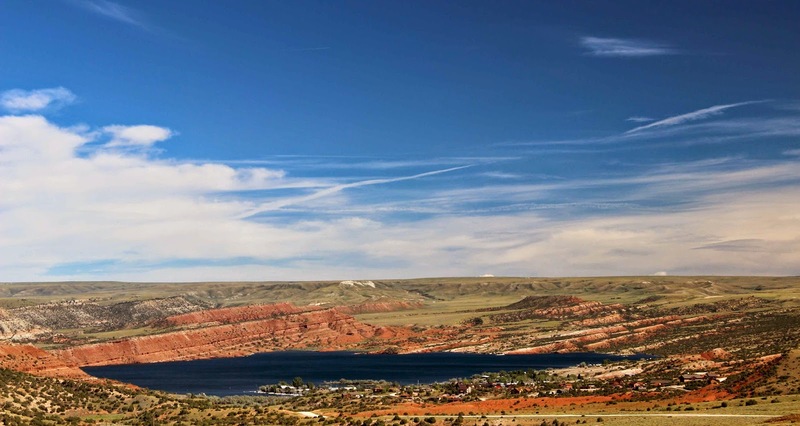 Alcova Reservoir is in a land of folds and faults. The scenery along the county road to the south is very different. Occasionally there were curious granite hills and mountains sticking up above the rolling land. They didn’t look much like Laramide mountains, which are elongate ranges with upturned sedimentary rocks on the flanks. These were bare rounded granite outcrops of various shapes and sizes, with no obvious geologic structure. This kind of scenery continued for miles and miles until I arrived at the north flank of the Seminoe Mountains -- steep, dark and ominous. It was hard to believe that the county road continued on, but it did! Here the North Platte River had cut into the surface I’d been driving on, revealing flat, undeformed rock strata. Aha! ... Tertiary fill! Informative exposure of nearly-flat pale Tertiary sediments, with North Platte River in foreground (bridge) and Seminoe Mountains behind. “Tertiary fill” refers to sediments that were eroded off Laramide mountain ranges and deposited in adjacent basins. When the basins were filled, deposition continued onto the flanks of the ranges themselves. Eventually they were mostly buried, with just the highest peaks exposed (cross-section below). Laramide uplifts were eroded and largely buried in Tertiary fill (yellow). Block diagrams by B Mears, Jr, from originals by SH Knight (Regional Geomorphology class, University of Wyoming, 1984). Then came the Great Exhumation (Snoke 1993) -- a time of widespread erosion. Much of the Tertiary fill was removed, uncovering the old landscapes. Why this happened isn't clear. Perhaps regional uplift increased erosive power of streams, or maybe climate change brought more rain and more erosion. Whatever the cause, exhumation was followed by yet another depositional phase (burial), and then another period of erosion (exhumation) to produce today’s great Laramide scenery. 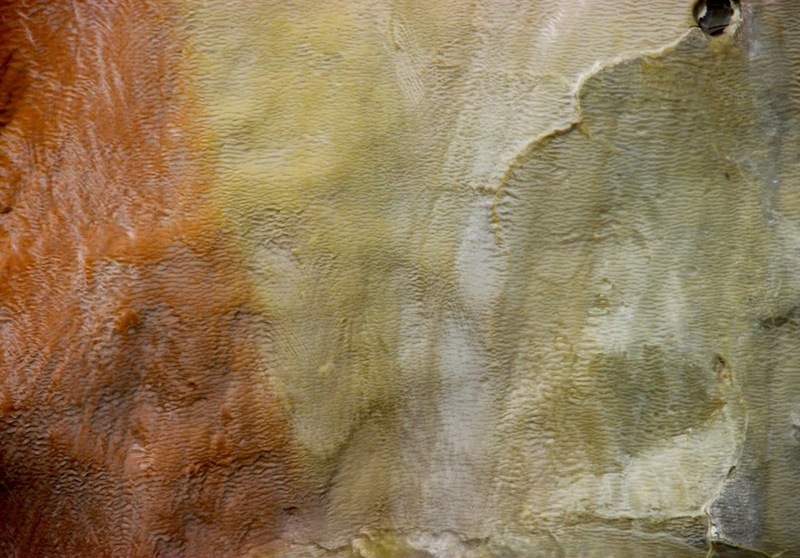 ... and then re-exhumed to produce today's Wyoming landscapes. -- Tertiary fill laps directly onto clusters of Precambrian granite outcrops. -- Boulders of the same Precambrian granite have been found on summits of mountains a short distance south, at higher elevations. -- Normal faults bound the area on the north and south (click on map to view). 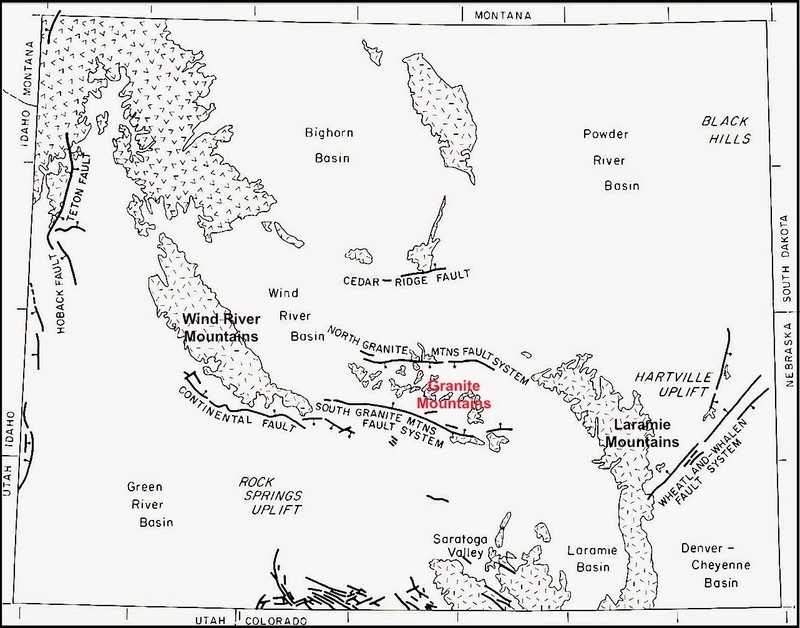 Neogene normal faults in Wyoming (Flanagan & Montagne 1993), with Granite Mountains labeled in red. Buried in the Tertiary fill are the remains of a Laramide uplift! These are the Granite Mountains, the most mysterious mountains in Wyoming. They were once a typical Laramide uplift, but then the core collapsed and the crest ended up below the flanks. The down-dropped block is bounded on the north and south by normal faults, forming a graben. Displacement is estimated to be 2000 feet. Because the block subsided significantly, much of the Tertiary fill has been preserved, with only the highest peaks of the old range exposed. So this is a remnant of Wyoming landscapes prior to the Great Exhumations (block diagrams 1. and 3. above). 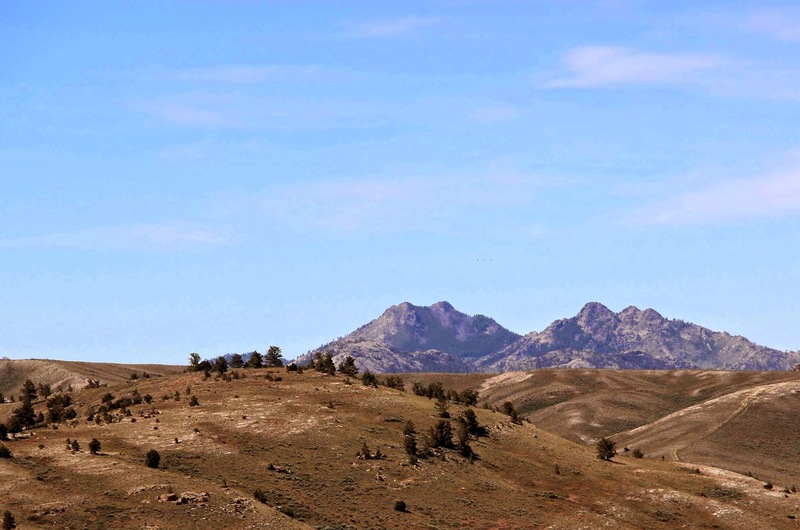 A bit of the Really Old West: high peaks of the Granite Mountains rise above Tertiary fill. These are the Pedro Mountains -- the east end of the old range. Cross-section through the Sweetwater graben (Mears et al. 1986); click on image to view. Only the core of the Granite Mountains collapsed; the flanks remained in place. These are now represented by the Rattlesnake Hills on the north side of the graben, and the Seminoe, Ferris, Green and Crooks mountains to the south. On the summits of Green and Crooks mountains are granite boulders eroded off the high peaks before they were down-dropped. In other words, the boulders now lie higher than their source. South side of Seminoe Mountains in distance, with steeply-dipping sedimentary strata. They were part of the south flank of the Granite Mountains before the core collapsed. Dark foreboding metamorphic rocks on the north side of the Seminoes, exposed by normal faulting. The normal faults of the Granite Mountains are fairly recent. Flanagan and Montagne (1993) dated them to about 11 million years ago, at least 30 million years after Laramide uplift ceased. The cause is debated. 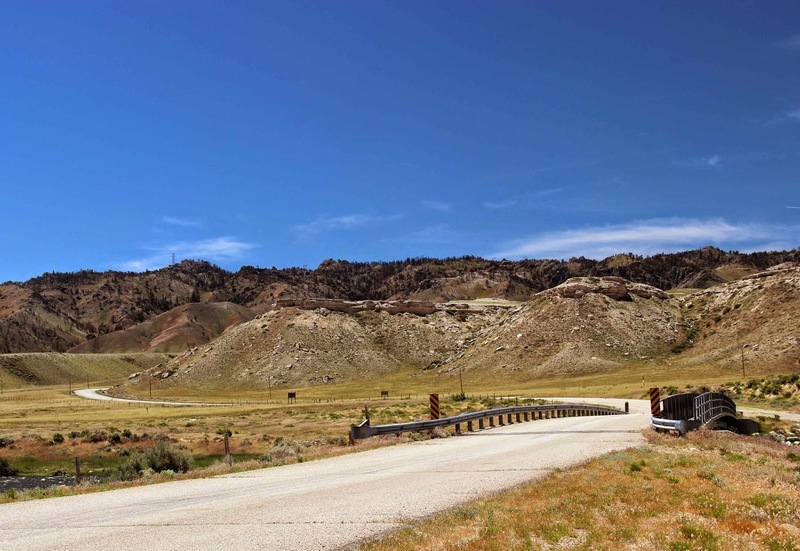 Normal faults generally are associated with crustal extension, yet there’s no clear link between normal faulting in Wyoming and the major episodes of Tertiary extension in western North America -- Basin and Range province and Rio Grande Rift. So “anomalous” is what it’s called for now (Snoke 1993). 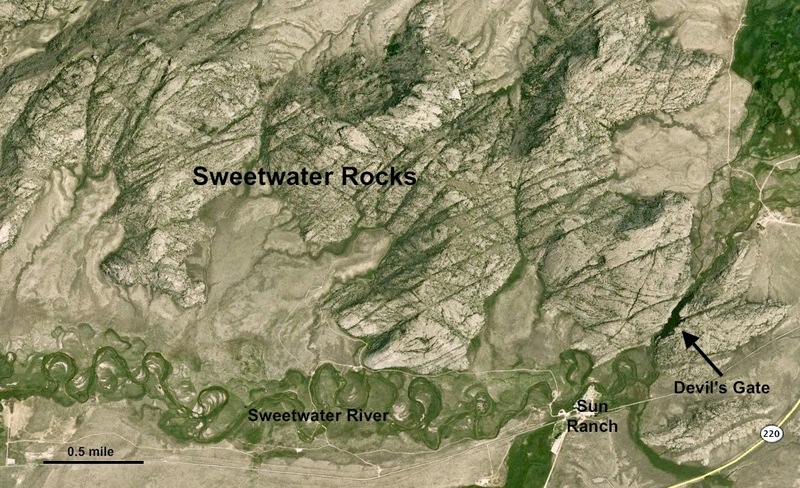 The Sweetwater River flows though the graben from west to east, through the old high peaks of the Granite Mountains. 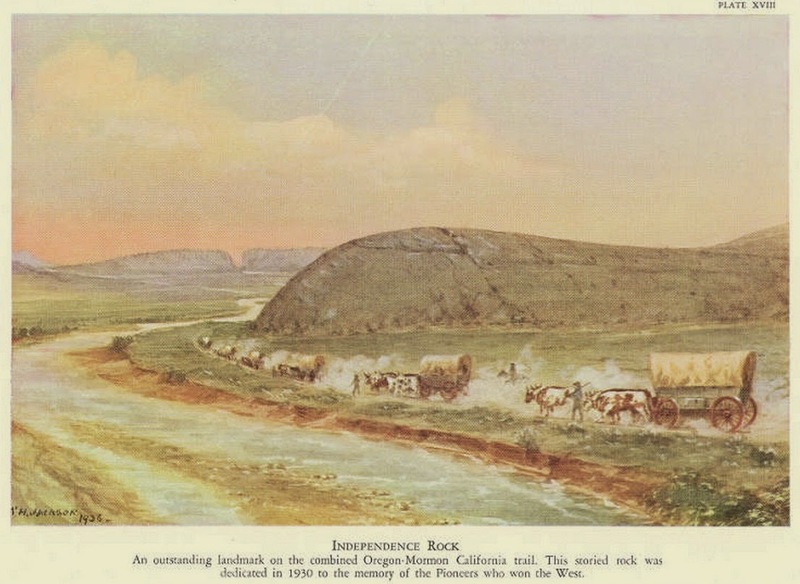 This was the route of the Oregon and Mormon Trails, traveled by many thousands of pioneers headed west to better lives. About 50,000 passed in 1847 alone (Blackstone 1988). 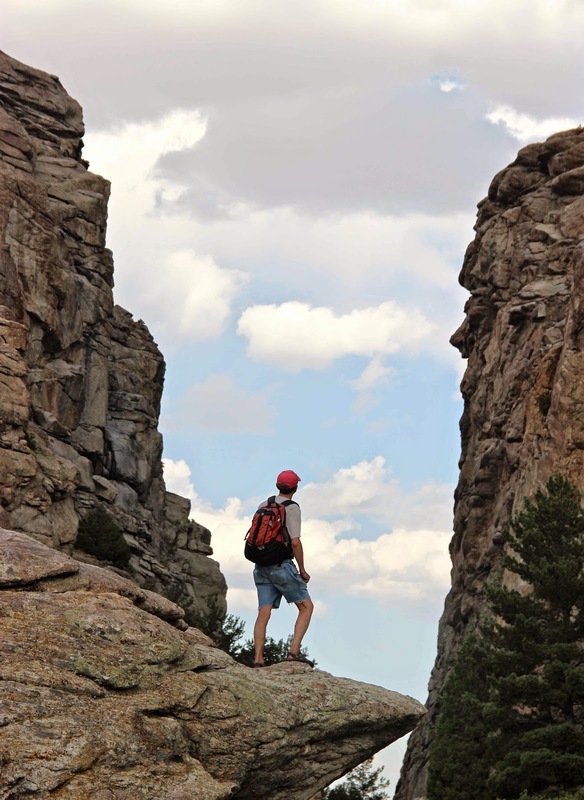 The granite outcrops became landmarks -- Devils Gate, Split Rock, Independence Rock. "Independence Rock" by WH Jackson. Split Rock is in distance. Source. “Camp of the US Geological Survey" in the Sweetwater graben; by WH Jackson, 1870. Source. "The Emigrant's Grave" along the Sweetwater River; by WH Jackson, 1870. Source. Other posts about the “Heartland of Laramide Tectonics” include an overview of the Folded Land, a look at the Great Unconformity, a tour of Permo-Triassic redbeds, and a search for Jurassic pterosaur tracks. Blackstone, DL, Jr. 1988. Traveler’s guide to the geology of Wyoming, 2nd ed. Geological Survey of Wyoming Bulletin 67. Laramie, WY. Flanagan, KM and Montagne, J. 1993. Neogene stratigraphy and tectonics of Wyoming, in Snoke, AW, Steidtmann, JR, and Roberts, SM, eds. Geology of Wyoming. Wyoming State Geological Survey Memoir 5:572-607. Laramie, WY. Mears, B, Jr, Eckerle, WP, Gilmer, DR, Gubbels, TL, Huckleberry, GA, Marriott, HJ, Schmidt, KJ and Yose, LA. 1986. 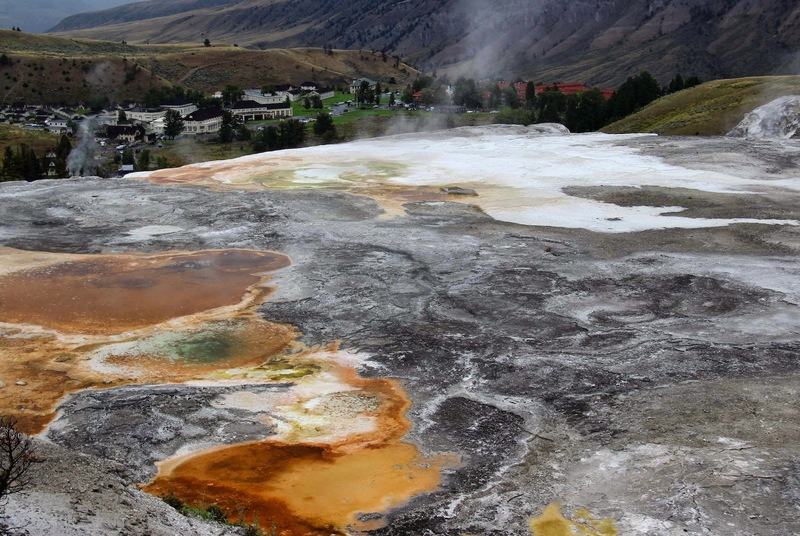 A geologic tour of Wyoming from Laramie to Lander, Jackson and Rock Springs. 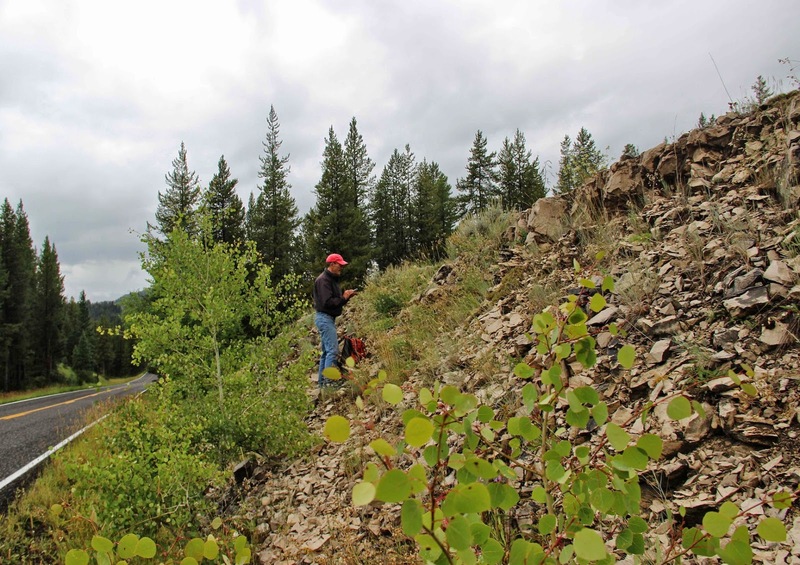 Geological Survey of Wyoming Public Information Cirucular No. 27. Laramie, WY. Snoke, AW 1993. Geologic history of Wyoming within the tectonic framework of the North American Cordillera, in Snoke, AW, Steidtmann, JR, and Roberts, SM, eds. Geology of Wyoming. Wyoming State Geological Survey Memoir 5:2-56. Laramie, WY.